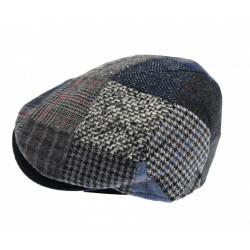 Timeless classic woollen patchwork cap with blue and grey colours. This peaked cap is a timeless classic, with a woollen grey and blue patchwork. Woollen, quilted inside for maximum warmth.